Tsimshatsui is full of the most amazing sights, a range of tourist sights mean that a full Hong Kong experience can be had even without leaving the district. Being part of the original British territory of Hong Kong it contains a number of interesting colonial items including historic buildings and parks. However it is the boom period of the 1950s and 60s which lead to the most rapid development of the area and cemented its reputation as a tourist destination for world travellers. Today the steady addition of new sightseeing attractions continues with everything from world-class museums to open public walkways with outstanding views. Cultural Centre and Museum of Art - Right on the waterfront overlook the harbour, these two buildings highlight what is most impressive about Hong Kong arts and culture. Chinese Arts & Crafts - located in Star House near the Star Ferry this is the original place to shop for valuable Chinese arts and crafts. See more details of shopping on TST here. 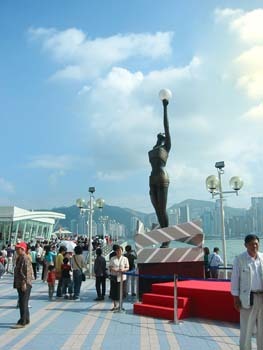 Museum of History - one of several great museums of Hong Kong. In Chinese the district is called 尖沙嘴, which literally means Tip Sand Mouth, and is a reference to the sandy river which once flowed here, long since covered by land reclamation. The pronunciation is impossible to describe using Roman letters alone, some attempts include Jim Shar Joy and Chim Sa Choi but none are of course accurate, and it is very hard for a non Chinese native to pronounce the words correctly. Hence the common abriviation into TST - sounded out as "tee-ess-tee". Everybody in Hong Kong will understand if you say TST. When it comes to writing you will see Tsim Sha Tsui and Tsimshatsui used equally, both are acceptable. But not Tsimsha Tsui or Tsim Shatsui, that would be incorrect. However you say or write it, TST is a fascinating place to be.